I first met James Hall (1811–1898) decades ago in the dim, air-conditioned vast space of the Field Museum’s invertebrate fossil collection. Not James Hall himself, but thousands and thousands of fossils collected by Professor Hall and his assistants over decades in the nineteenth century. I thought, as a brash youngster, that I knew something about fossils before I met James Hall, but my expertise was acquired from reading and studying paleontological monographs and their illustrations. Encountering Hall’s collections was the start of my paleontological education in earnest. I was transformed over many summers into a student of James Hall, even though he died years before my birth. His collections opened my eyes and mind to the true diversity of Paleozoic fossils, which I only knew in a fragmentary way from fossil hunting forays in Silurian limestones, Pennsylvanian concretions, and digesting many books. My गुरु, Dr. Richardson at the Field Museum, introduced me to Professor Hall in those quiet halls of the Museum; I still learn much from both mentors to this day. How did James Hall, state geologist and state paleontologist of New York based in Albany, appear in Chicago? Hall seemed always locked in battle with politicians in the State Assembly, in efforts to secure more funds for his research and its eventual elaborate publication, with beautiful illustrations. His efforts yielded one of the most significant paleontological works of all time, 13 delicious volumes of the Palaeontology of New York, published between 1847 and 1894. Palaeontology of New York is as phenomenal, pour moi, as Joachim Barrande’s (1799–1883) 29 volumes comprising Système silurien du centre de la Bohême, released between 1853 and 1911, in the same stratosphere as Alexandre Édouard Maurice Cossmann’s (1850–1923) stupendous Catalogue illustré des coquilles fossiles de l’Éoceène des environs de Paris (1886–1913). James Hall decided not to leave his tremendous fossil collections in Albany at the State Museum, so he sought out other interested parties and institutions. Chicago, July 2. 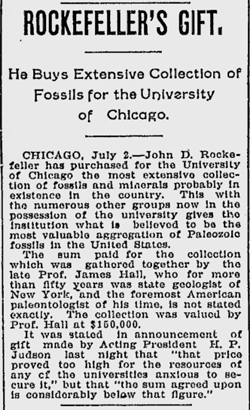 — John D. Rockefeller has purchased for the University of Chicago the most extensive collection of fossils and minerals probably in existence in the country. This with the numerous other groups now in possession of the university give the institution what is believed to be the most valuable aggregation of Paleozoic fossils in the United States. The sum paid for the collection which was gathered together by the late Prof. James Hall, who for more than fifty years was state geologist of New York, and the foremost American paleontologist of his time, is not stated exactly. The collection was valued by Prof. Hall at $150,000 [Allowing for inflation, $3,781,874 today!]. Hundreds of thousands of Paleozoic invertebrate fossils, books, papers, woodcuts, and other material made their way by railway and boxcar from New York to the campus of the University of Chicago and the Walker Museum. 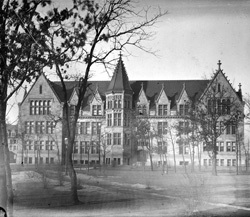 In 1961, the University decided to combine the Departments of Geology and Meteorology, eventually moving the just invented Department of the Geophysical Sciences west on campus to a new structure on Ellis Avenue, the Henry Hinds Laboratory for the Geophysical Sciences (which opened in 1969 and bears absolutely no resemblance to the Walker Museum). Hinds did not include space for tens of thousands of fossils, which were transferred to the Field Museum. It was in 1966 that I first met Professor Hall’s collection, as a very part-time go-fer helping to organize drawer after drawer and case after case of incredible specimens. I spent the summers of 1967, 1968, and 1969 among those treasures, absorbing taxonomy, classification, history, bibliography, and much else in situ. 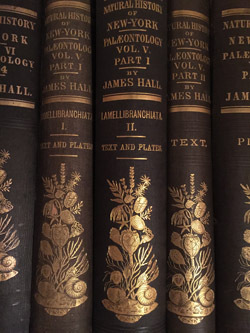 Thanks to that deep immersion in all things James Hall, I have sought out many of his publications; according to one biographer, Hall authored over 40 books and some 200 papers. In this never ending quest, I recently acquired Hall’s report on the geology and paleontology of Iowa, published in two parts in 1858. What was Hall doing in Iowa? As one of the premier geologists and paleontologists in the middle of the nineteenth century, James Hall was in high demand to help states assess their natural resources. Hall was always in need of research monies, and was not barred from moonlighting by the State Assembly of New York. Indeed, the State Assembly blocked Hall’s salary in 1850! Hall wisely hired well qualified assistants to do much of the field work. In Iowa, Hall had two special helpers, Amos Worthen (1813–1888) and Josiah Whitney (1819–1896). Amos Worthen was named the second state geologist for Illinois after completing his efforts for Hall in Iowa. Worthen created a memorable series of monographs entitled Geological survey of Illinois, published in eight volumes between 1866 and 1890. Whitney eventually became state geologist of California; I remember Whitney for his battles with the California Legislature (à la Hall and Albany) and his name on the highest peak in the Sierra Nevada, Mount Whitney (14,505 feet high). Hall’s report to the Governor and Legislature of Iowa took longer to complete and cost more than expected, mais naturellement. The report was released in 1858 as Volume 1, Part 1: Geology, and Part 2: Paleontology but no further volumes were released with Hall, Worthen, and Whitney — other than a 92-page, three plate supplement by Hall, Contributions to the palæontology of Iowa; being descriptions of new species of Crinoidea and other fossils, appearing in 1859. 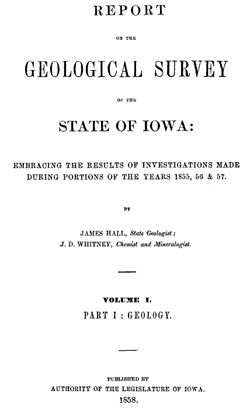 As always, I carefully read and examined the two volumes of the Report of the Geological Survey of the State of Iowa: Embracing the results of investigations made during portions of the years 1855, 56 & 57. I was surprised to find a folded sheet of stationery in the second volume on paleontology, between pp. 664–665. In ink, it noted: “To Mrs. J.M. 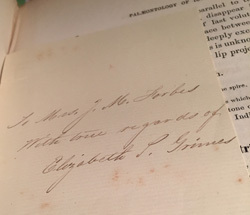 Forbes With best regards of Elizabeth P. Grimes”. It is undated, but seems unrelated to the printed text, descriptions of the mollusks Cypricardella subelliptica, Pleurotomaria wortheni, and Capulus acutirostris. Elizabeth P. Grimes (née Elizabeth Sarah Nealley) was the wife of James Wilson Grimes (1816–1872), the third Governor of Iowa. Governor Grimes’ term, 1854–1858, coincided with the start of Hall’s survey. Grimes signed the legislation approving of the survey on January 23, 1855. Grimes and the Legislature approved a continuation of the survey on January 24, 1857, after Hall made it clear that he and his team had not completed all of their scientific activities in the state, mais bien sûr. By the time the survey report was published, Grimes was out of office, replaced as Governor by Ralph P. Lowe (1805–1883). However, the original legislation to create the survey described the exact distribution of copies of Hall’s study, allocating 25 copies to Grimes. Mrs. J.M. Forbes (née Sarah Hathaway) was the wife of John Murray Forbes (1813–1898), a significant figure in American industry and politics. He and his wife had connections to Iowa thanks to Mr. Forbes’ presidency of the Chicago, Burlington and Quincy Railroad in the 1850s. One of the most successful railroads of the nineteenth century, the Burlington. as we know it today. is still an important link to all of the resources in the Midwest and West. Mrs. Grimes must have been shocked that Mr. and Mrs. Forbes did not have a copy of Hall’s report. Since she had a number of copies sitting around, it is not surprising that she passed along Hall’s Report of the Geological Survey of the State of Iowa to the Grimes for their personal library. This note, hidden in this copy of the second volume for over a century, seems to be proof of this gift.